Are you a Sports Mom having trouble removing smells from your car thanks to all your kids athletic gear? I’ve got just the thing to remove that Locker Room Smell! 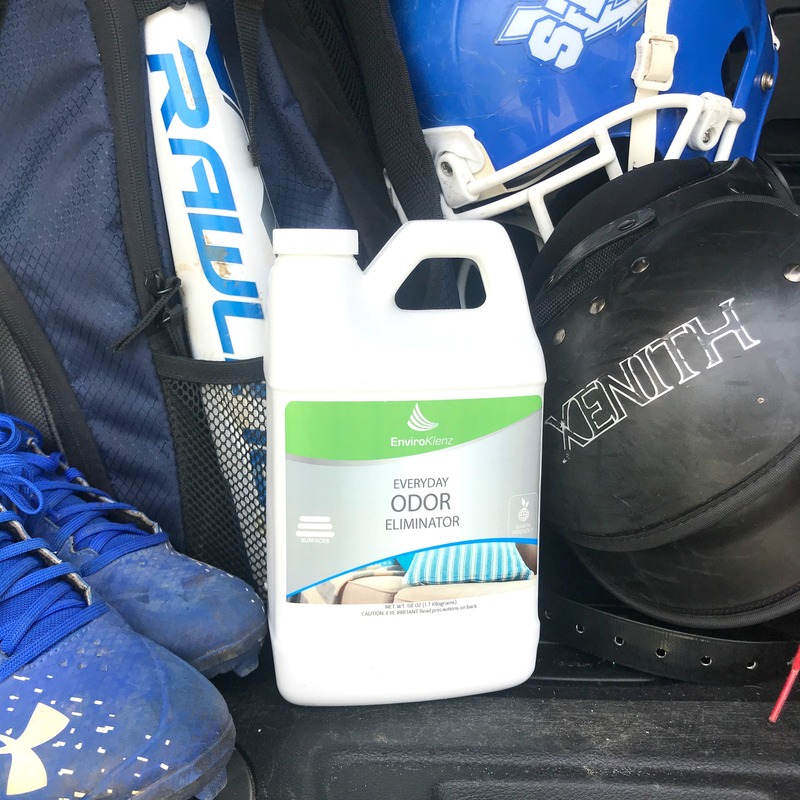 Cleats, Bat Bags, Shoulder Pads, Helmets, Sparring Gear, Swim Bags, Towels, and Sneakers all have one thing in common – well aside from they are constantly being left in my car and taking up all my trunk space – THEY SMELL! As a sports mom of four you can find me every evening driving around town from one field to another, to the pool, the dojo and back over and over again and all of the kids’ sports gear gets tossed in the trunk for hours. They bring along their dinner, their sports drinks and their changes of clothes. The PE clothes they had worn to school that afternoon get shoved under the seat and swapped out for baseball pants and shoulder pads. The towels from swim practice manage to always get left in the car overnight and help us all if it rains during football practice – the mixture of sweaty socks and muddy water is a smell none of us can bare! Yep – my car is a locker room on wheels and even though we take the gear out nightly and clean the car once a week I was finding I just couldn’t get rid of that musty smell in my car. You know the one – it’s a little mildewy, a little musty, a little muddy, and a lot of sweat. The car is clean but that smell just hangs in the air! After some searching I finally found a way to GET RID OF THE LOCKER ROOM SMELL in my car!! And bonus – I found a way to finally get the smell out of their sports clothes too! To remove the smells from my car I use EnviroKlenz Everyday Odor Eliminator! The EnviroKlenz Every Day Ordor Eliminator is perfect to use in the car and the house – it can be used on water-safe surfaces and is designed for use on carpets, fabrics, some upholstery and other water-extractable surfaces. I use the EnviroKlenz Everyday Odor Eliminator to destroy those stubborn odors from pets, kids, spills, and of course sports gear! This product works deep down, eliminating the oders at the chemical source providing maximum neutralization and odor extraction. To clean out all the smells from the car I use the hard surface dilution recommendation on all hard surfaces. I then continue on to the carpets and headliner of the car suing the reommending dilution for soft surfaces. To make sure the kids’ sports gear stays fresh and odor free I use the EnviroKlenz Everyday Odor Eliminator on pads, helmets and gear too! Another area that is hard to rid of smells is the gym clothes and sports jerseys! To make sure the kids are always fresh for games I use the EnviroKlenz Laundry Enhancer. I can’t tell you how many times I’ve wash a Football Jersey only to pull it out of the machine to still have that musty locker room smell to it! 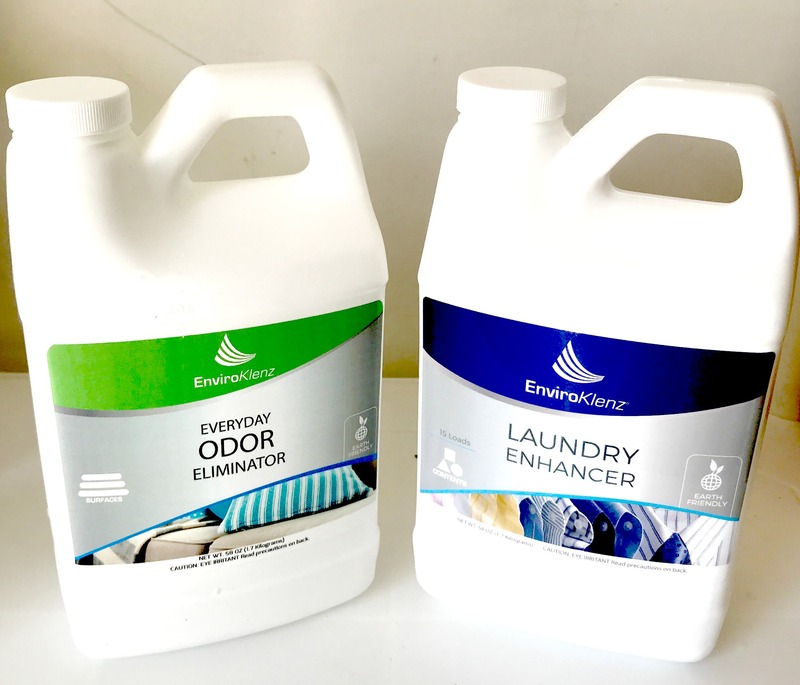 The EnviroKlenz Laundry Enhancer makes it easy to remove all the odors from your clothing as well. 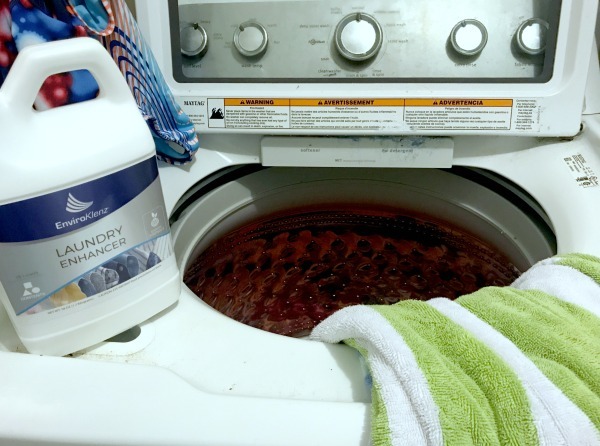 EnviroKlenz laundry enhancer can be added directly to your wash along with detergent and is safe for use on cotton, personal delicate, nylon, polyester, spandex, washable lace, washable rayon, washable, wool and all other washable fabrics. The product is safe for the environment and safe to use in high efficiency washing machines! If you’re tired of driving around in a smelly locker room on wheels and want to make sure your car and house is odor free I have a special coupon code for you to use! Purchase your EnviroKlenz Everyday Odor Eliminator and Laundry Enhancer and use code: WM15 to receive a 15% off discount for your order.